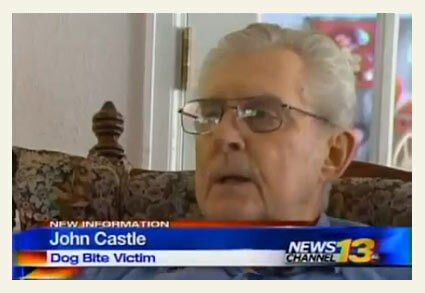 Pit bull attack survivor, John Castle, asks "Why no pit bull ban?" Colorado Springs, CO - A courageous 79-year old man from Colorado Springs who suffered a life-threatening pit bull attack in 2012, recently sent a letter to DogsBite.org. His letter details his violent attack, what city officials did afterward (not much) and how he is currently trying to address city council members about this vital public safety issue. We are publishing his letter in full -- bold emphasis on the part of the victim. DogsBite.org added links to deepen and broaden his letter. His letter expresses his outrage at what happened to him, the misery of the medical procedures he endured and how he continues to suffer today. He expresses shock that his outrage is not shared by city council members who continue to "profess ignorance" about the dangerousness of pit bulls. Finally, to "add insult to injuries," he states, he was jolted to learn that a "Service Dog" pit bull recently moved into his housing complex: "I'm scared to death. Along with 150 other seniors." We greatly thank John Castle for his outrage, his compassion and his courage to speak the truth. No Pit Bull Ban! Why? Why doesn't Colorado Springs have a Pit Bull ban to protect her citizens like the seven responsible cities north of us? Denver led the way back in 1989, that's nearly 25 years ago. At least seven other Colorado cities have since adopted Denver's Pit Bull ban or one similar to it. Why not Colorado Springs? If our Colorado Springs council members are not serving (protecting) their citizens, than who are they serving? Why have our Colorado Springs council members chosen to ignore all of the overwhelming evidence on this dangerous animal, while putting her citizens at risk? "Denver's pit bull ban is the most controversial in the U.S. Over the course of 24 years, the ban has withstood numerous battles in state and federal courts. On each occasion, the City and County of Denver has prevailed. The litigious history of the ban, and Denver's consistent victories, has helped many cities adopt similar measures. The Denver pit bull ban is undoubtedly the beacon that illustrates the legal viability of breed-specific pit bull laws." Eight cities in Colorado protect their citizens with Pit Bull bans: Castle Rock, Aurora, Denver, Commerce City, Lone Tree, Louisville, Fort Lupton, and Lajunta. Seven hundred and sixty three cities in the U.S. protect millions of their citizens with Pit Bull bans or restrictions. Forty states in the United States contain jurisdictions that protect millions of their citizens with Pit Bull bans or restrictions. Forty countries (whole countries) protect millions of their citizens with Pit Bull bans or restrictions, here's some of them: Argentina, Austria, Bavaria, Bermuda, Denmark, Ecuador, France, Guyana, Israel, Liechtenstien, Malta, New Zealand, Norway, Portugal, Puerto Rico, Romania, Singapore, Spain, St. Kitts and Nevis, Switzerland, Turkey, the UAE, United Kingdom and Venezuela. Our closest U.S. neighbor, the Province of Ontario, Canada and her major cities of London, Toronto, and Ottawa protect her millions of citizens with a single Pit Bull ban. Colorado Springs is completely surrounded by Pit Bull bans (North, South, East, & West). In fact: every military base in the United States protects their personnel with Pit Bull bans, including: Our Air Force Academy, Fort Carson, Peterson, and Shriver military bases. millions of citizens and military personnel with Pit Bull bans?Because the Pit Bull is dangerous and unpredictable. The Pit Bull is responsible for the majority of U.S. human deaths caused by dog bites, over 60%. Hundreds of humans have been killed by Pit Bulls, and thousands have been maimed. See DogsBite.org -- Read many of the case histories of these deaths and injuries. About 65% of those deaths are children under the age of ten. Little children! Like the 4 and 5 year olds that opened the neighbor's gate to play with the doggies; they were promptly torn apart and mauled to death by three Pit Bulls. Just babies! Who should be held responsible for their deaths? Pit bulls kill more people than all other dog breeds combined! Around 10:00 am Labor Day 2012, about a year and a half ago, I was returning home from my three mile walk up to Union Blvd, which includes Memorial Park and Prospect Lake. While walking on the south sidewalk of Pike's Peak Avenue in front of the Homewood Point apartments, a Pit Bull attacked me from behind without warning. He sunk his teeth into my lower left leg, twisted and pulled, which turned me toward him causing me to loose my balance and fall. While falling, he was airborne lunging at my throat. I threw my hand up to my throat, he tore my hand up. As I hit the ground, again he lunged at my throat. At that second, his owner jumped on him and held him as I felt his hot breath from his wide open jaws and looked into the eyes of an animal that wanted to kill me. Had my reflexes been a second slower, he would have ripped my throat out. He was extremely fast and powerful, disabled me in a matter of seconds. I rolled backwards away from him and somehow managed to get to my feet, even though my left leg was paralyzed with pain, my hand was hanging in parts, and I was dazed from hitting my head from the unblocked fall. I dragged myself out into Pikes Peak to get help. There was no immediate traffic. I continued to drag myself across the street where I ended up hanging over the railing beside the Deaf and Blind school in a great deal of pain and bleeding profusely. Eric Brooks and others from Homewood Point Apartments came to my aid. Eric called 911 and did a good job trying to console me until the ambulance left. And has since been very helpful and a strong witness in criminal court. I've experienced a considerable amount of adversity in my 79 years, but this was the most terrifying experience of my life; I came within a second or two of a violent death at the jaws of a Pit Bull. Would a Pit Bull ban have prevented my life threatening attack? What do you think? You or a family member could be next. My first stop was Penrose Hospital where a several hour wait trying to locate a local hand surgeon failed. That sent me on a painful ninety mile ambulance ride to St. Anthony's Hospital in Lakewood, where I would spend the next few days for reconstructive hand surgery and treatment to my leg. A few days after I returned home, my lower leg swelled double its normal size and turned beet red. I was readmitted to Penrose for severe infection at the sight of the dog bite wound. Then came the excruciating rabies shots because they couldn't find the dog. I later learned from the Humane Society and the District Attorney that the owner hid the dog, and even denied that he owned a Pit Bull. Over the next several weeks, I would complete the excruciatingly painful rabies shots. And several more weeks of daily trips to the infectious disease clinic for one hour intravenous antibiotics. Then came the daily nurse visits to swab out the wounds, which consists of stuffing specially treated gauze deep into the wounds and slowly pulling them out with the infection, very painful. Therapy and treatments continue on my other injuries (head, neck, ears, eyes and posttraumatic stress disorder). While suffering countless nightmares from the Pit Bull's life threatening attack and injuries over the last year and a half, my suffering still continues. All during this time the LAW has protected the Pit Bull by allowing it to remain free. Yes, it's still free, from the time the owner and the Pit Bull ran from the scene of the attack. If a person had attacked me with the same results there would have been an all points bulletin out on that person promptly, but not the Pit Bull. That's in the hands of our trusty Colorado Springs Humane Society, protectors of Pit Bulls. Would a Pit Bull ban have prevented this life threatening attack? Probably. Then why doesn't Colorado Springs have a Pit Bull ban? Should Colorado Springs be held responsible for this vicious attack; are they guilty of negligence? How in the world can all of the past and present council members profess ignorance? Who are they serving? I've been told by a reliable source that there is a small self-serving group of people that have successfully (secretly) lobbied the Colorado Springs council members against a Pit Bull ban for years, at the risk of the rest of its citizens. Imagine that! Our Humane Society is the leading promoter of Pit Bull adoptions in El Paso county, whereas, national pet shops will not handle Pit Bulls because insurance companies will not insure them. Colorado Springs, it's not a matter of if, it's a matter of when the Pit Bull will kill. There have already been many close calls. The library, police department and Gazette have a long list. The greatest pain I suffer today is from not being able to take my grandchildren to all of the outdoor activities at our beautiful parks that we have visited for decades. My fear of the Pit Bull prevents this. I have no idea how I would protect my grandchildren from an attack. That I couldn't live with. Now add insult to injury or maybe more injury. 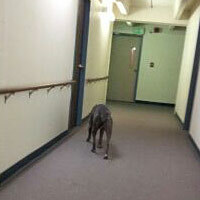 Recently, Colorado Springs housing allowed a Pit Bull to move into our housing complex as a "Service Dog." The number one national killer of humans as a service dog. I'm scared to death, along with 150 other seniors. We all feel threatened! The Pit Bull has already been seen running loose in the hallway (see below photos) and the laundry room without a leash. I will not allow my grandchildren to visit me under the threat of this Pit Bull. Finally, I requested ten minutes to make a presentation to the Colorado Springs City Council on a Pit Bull ban from my Councilwoman Jill Gaebler. Her assistant allowed me three (3) minutes, which I knew would be impossible. I'm mentally slow, I suffer with pain, a balance problem, and I'm hearing impaired, all from the Pit Bull injuries. But I still tried. I was reduced to leaving a complete packet of information on Pit Bull bans and my story with Council President Keith King to share with the other members of the council. That was nearly two months ago. Not a word from any council member. No Pit Bull Ban! Why not? This question should be answered in honest and accurate terms to the citizens of this city. Note the involvement of the local humane society in the promotion of pit bulls. Same thing's happening here in Tucson, Arizona. The Humane Society of Southern Arizona is as big a pit pusher as our tax-supported Pima Animal Care Center. This story makes me so angry, but it wraps the whole sordid pit-uation in one neat little package. "We", meaning our elected officials and government employees (AC), WILL NOT do their JOBS to protect even the most vulnerable of us because they're either in bed with, or afraid of the pit-lobby. Does that "service pit" have testicles? Actual service dogs are with their owners at all times in case the owner needs help. 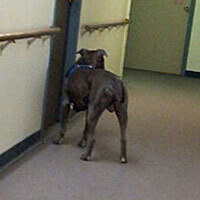 A pit bull wandering the halls off leash and without an owner is obviously a fraud. Mr. Castle has more than made his point here. Lawmakers are far too easily influenced by special interests and pit bull advocacy is a small but very vocal, well funded and well organized special interest group. Nice stunt pit – with balls of course. I wish there was a law regulating service animals. These fakes are out of control. This gentleman's story is heart wrenching. My 77 yr old mother was recently attacked by a friends bogus therapy pit bull. She is still suffering PTSD and has pain from injuries. The owners show no compassion and have not offered any help. Even trying to blame my mom because she was afraid of the dog. These attack stories need to be out there in mainstream media daily. You do not have to suffer just because the pit is a so called service animal. Most landlords and managers HATE the abuse of this ADA loophole too, as it sets them up for a major liability that they cannot protect themselves from. Most will be thrilled to get rid of this problem. They just need to do it legally. How? ALL dogs, even service dogs, must STILL follow the rules the apartments/housing has for pets. They are not exempt from these. In my apartments, if there is one event where a rule is broken, you can get 24 hours to get rid of the dog. Fail to comply, you get another 24 hours to vacate before the sheriffs come. The rules will be written, and should be part of the lease for pets. Here, being off leash at all is a serious no-no (for all dogs, and they are serious about this one). The instant this mauler is off leash, he will be removed. Same for nuisance baring, leaving poop all over, aggressive activity, etc. GET A COPY of the rules for your place in writing. Ask what will happen if the rules are broken, and get that in writing, or record it. Then keep your camera handy. I would bet that these pics would be enough to get this faker removed, if they have a rule about being on leash. You can push the situation by having a lawyer send a letter on your behalf. Make sure you have as much hard evidence as you can, I hear natters like to fight about this even when they are obvious liars. I am currently dealing with this same exact problem. These guys 3 doors down (and 10' off the playground!) moved in, and a few months later brought home a pit bull puppy claiming it is a service dog. This is in apartments where both dogs over #35 AND under 1 yr old are strictly banned. (It is a FAKER- they go to work all day, leaving it home, they claimed its a service dog at 5 mo old, and it cannot even walk well on a leash! I know these guys, and bother are perfectly fit and healthy. They make a mockery of the ADA and the rules). Hope this helps. Do not be a prisoner in your own home. Fight back. I am pretty sure that a legitimate service dog is always spayed or neutered. The last thing anyone needs with their service dog is for it to be hormonal. Even if we were to believe that a pit bull was a service animal (and thats a crock) the fact that it has testicles is a sure sign its a fake. I have known several puppy raisers of guide dogs and those dogs have been spayed or neutered with the exception of one female who the guide dog group kept as a breeder instead of putting her into service. (her littermates had trained so well with a high percentage going on to service that they wanted her genetics to continue with their program). They use Labradors by the way, not a single pit bull in their program…. My heart goes out to you, Mr. Castle. I commend you for taking on the pit bull issue in Colorado Springs. Hopefully, you can move or have the pit bull in the housing complex evicted. We live 2 blocks from where you were mauled. Twice in 2011 our family was attacked by pit bulls in nearby Shooks Run Park. We wrote a letter to Mayor Bach and our city Council woman. Channel 5 did two news stories about us that can still be read online. We no longer go to Shooks Run Park. Our Pomeranians ride in a dog stroller in public and we carry defense weapons. But we did not have the courage to take on the pro-pit bull folks of Colorado Springs.